Sunday morning was perfect. 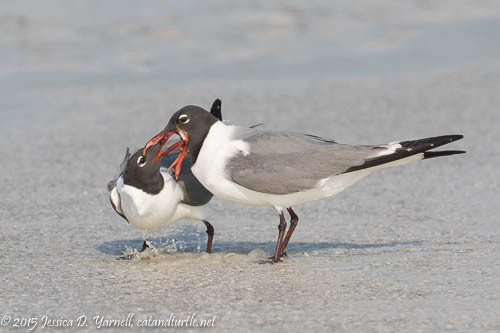 The alarm went off at 4am and I dusted off my poor cameras from their neglected shelf and headed to Fort De Soto. At 6:45 I was standing at the East Beach turnaround watching the sun try to rise. The cool breeze blew on my face and the sand tickled my toes. My vacation was finally here!! Inspired by my friend Michael, I set up my iPhone to capture a time-lapse of the sunrise while I worked with my big camera. It was a very peaceful half hour. I’ve never seen so many mullets jumping! At one point three jumped at once! The clouds brightened in the distance, then faded. Then as the sun finally emerged, it turned into a bright yellow orb behind the clouds. It was magnificent. At that moment, a Great Blue Heron decided to meander by, to the delight of the small group of photographers that had by that time gathered. I took a stroll along the East Beach to see the Great Horned Owl nest there. I was feeling a bit owl-deprived, as I’d missed all my springtime nests this year. So I was excited to see the two big babies hunkered down in their nest. They were smart. It was very very windy that morning, with winds at sunrise a steady 20mph. If I was a bird, I’d have stayed deep in my nest too! 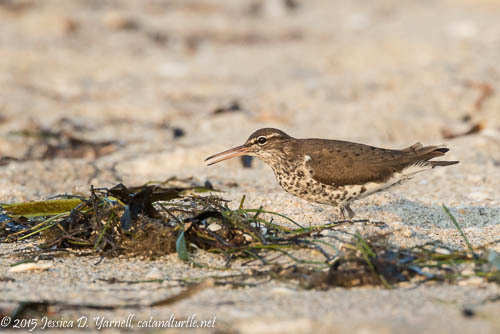 I spotted several Ruby-throated Hummingbirds vying over a single flower, and then my eyes fell on this small shorebird, who turned out to be a Spotted Sandpiper in all his breeding-color spots. My next stop was at North Beach, one of my favorite photography locations in the world. Even the crazy winds can’t ruin a morning of photography there. When I first walked onto the beach, I was surprised to see a trio of Red-breasted Mergansers diving in the heavy surf, right on the beach. Then I headed to the lagoon area, where the winds weren’t quite as heavy. A small group of shorebirds gave me plenty to watch for several hours. 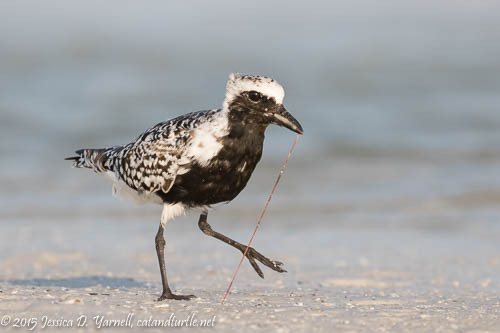 The Black-bellied Plovers were almost all molted into their breeding plumage. This one will get a little blacker still in the next few days. Then he’ll head off to the Arctic to make his nest. He ran along the shoreline, pausing every so often to poke his beak into the sand in search of his breakfast. In the photo above, he emerged victorious with a small worm. 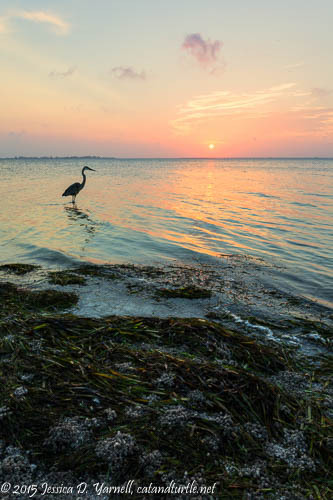 Fort De Soto is known for its tame Reddish Egrets, who entertain photographers with their “drunken sailor dances” as they go fishing. 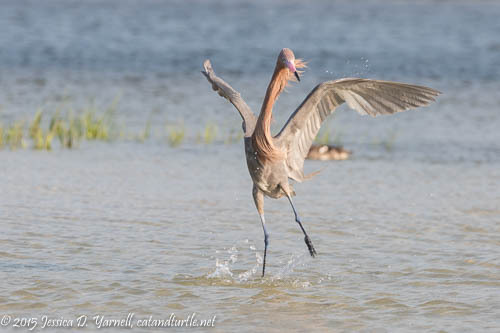 On this morning, a lone Reddish Egret stood with his head defiantly facing the wind. I must have sat there for at least an hour before he moved. Then when he started to dance, he’d throw himself into the air and let the wind carry him. He looked pretty funny. 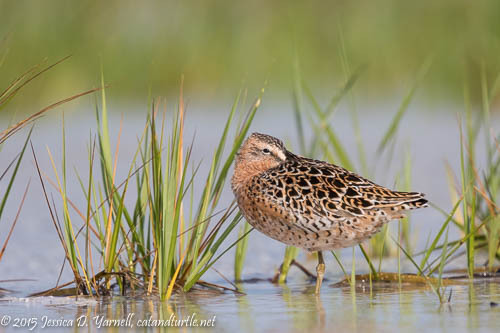 A huge group of Short-billed Dowitchers stood together near a clump of beach grasses. They too are emerging into their breeding plumage, with bright feathers of reddish-brown replacing their tired gray winter feathers. This one was so busy sleeping that he hardly noticed me approaching with my camera. It’s amazing how shameless these birds are, often chasing after each other in the middle of a huge flock of other birds, and calling like crazy! Just by listening, it’s easy to tell if there’s any hanky-panky going on. My best bird of the morning was one I’ve sought for the past several years. 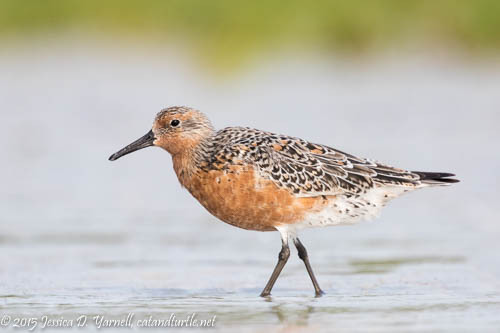 The Red Knot is a bird that migrates through Florida each spring as the birds fly from the southern tip of South America to their breeding grounds in the Arctic. The majority of the world’s population stops over in Delaware Bay to feed on Horseshoe Crabs before continuing north. I was pleased to see many Red Knots that morning, several of them molting into their reddish breeding color. How fun! Awesome shots Jess! Looks like a great beginning to an awesome vacation. Are you on vacation still this week? Glad to see you’ve made it out with the camera!! Thanks, Michael! I’m sorry I missed seeing you on this vacation. We need to visit skimmers in a few weeks! 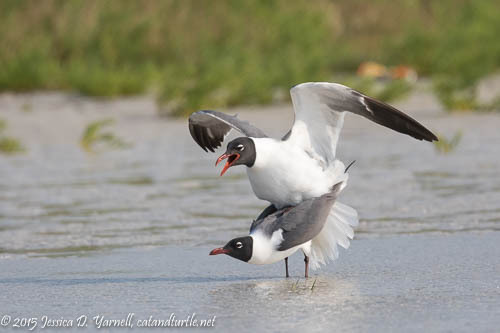 Ahh, just looking at your wonderful photographs I can smell the salt air, feel the cool breeze of the morning and hear the gulls and terns. Thank you! Terrific images! I’m quite jealous of the Red Knot in breeding plumage! That’s it. Road trip this week. Your blog posts make me feel like I’m there with you and Gini, too, Wally. :) I hope you see your Red Knot. They were congregated with the dowitchers at the North Beach lagoon while I was there.